The NIA court dismissed the case of the Mecca Masjid blast case. The five accused in the case have been declared guilty. Swamy Aseemananda, Devender Gupta, Rajendra Chowdhary, Lokesh Sharma and Bharat Bhai were attended Charlapalli jail to Nampalli court on Monday morning. After hearing the arguments, the court ruled that the case was being dismissed as there was no evidence. Five of the ten accused have been fined and three others are absconding. Sandeep V. Dange, Ramchandra Kalsangar, and Amit Chauhan are absconding. The trial of Tejram Param continues. Sunil Joshi was killed by a suspect. The police were heavily deprived of any unwanted incidents in the face of the verdict of the case. Today, the case of the Mecca Masjid blast that killed many innocent people has been finalized. The victims, who had been convicted by the court for strict punishment, were finally disappointed. The special NIA court in Nampalli hit the case saying that the prosecution failed to prove the conviction of the accused. Within two minutes of the trial, the five accused were pronounced guilty. In this case, NIA identified 10 people as accused. One of them died and four others were on trial. The charge sheets are filed against the other five and they have to be sentenced. The NIA special court on Monday ruled that the case was being dismissed as there was no evidence. The bomb exploded at 1.18 pm on May 18, 2007. There were explosions in the Mecca Masjid with cellphone help. A total of 14 people were killed in the accident. Five of them were killed in police firing. 58 people were injured. The police said that the police had fired to disperse the crowd as groups. The most powerful IED was used. In the case of the nation, the CBI and the NIA have investigated many of the twists and sops, including the local police. Hundreds of suspects were detained and the court declared them guilty after the inquiry. The NIA special court has declared five of the accused who were acquitted. The police felt that the Pakistani inspired ISI agents were committed to this offensive. Huji commander Shahid Bilal had been campaigning in Bangladesh or Pakistan for an array of explosions. The case was registered under the Husseini Alam police station and the investigation began. The then Andhra Pradesh government has issued directions to transfer the CBI to the CBI without any progress in the case. More than 100 youth from Hyderabad have been detained and arrested. The investigating agency has arrested three persons, including Sunil Joshi (Madhya Pradesh's Sunil Joshi), who was murdered while under trial in the case, while Sandeep V Dange and Ramchandra Kalsangra were still absconding, including Tejram Parmar and Amit Chauhan inquiry Esaru. Devendra Gupta of Rajasthan RSS publisher, Lokesh Sarma from Madhya Pradesh, Gujarat, Swami asimananda, a private employee ratesvar Bharat Mohanlal, Rajinder Chaudhary filed chargesheets. Badhitulatopatu 411 226 people, examine documents submitted to the court. Based on them, the Fourth Additional Metropolitan at Nampalli The city had issued a special court ruling and five of the accused were pronounced as accused.The city team was arrested in connection with the case and Lokesh Sharma, one of the accused, arrested the 2008 Malegaon blast accused Devender Gupta. However, the NIA withdrew allegations against Prakash Singh Thakur and four other accused in the Malegaon blasts along with Lokesh Sharma. The bombers in Mecca Masjid were initially considered to be terrorist organizations like Lashkar-e-Taiba or Harkat-ul-Jahad al-Islami. In December 2010, the CBI filed a charge sheet against the CBI's Gupta and Sharma on the Mecca Masjid blast case. There are also allegations that they have a role in the Ajmer Dargah blast case. The CBI also named four others along with them. The case was later handed over to the NIA. In May 2011, NIA officers filed a charge sheet against Navakam Sarkar alias Swami Asimananda. The Nampally court has been investigating only 60 witnesses to 226 witnesses. In 2013, the Dilsukhnagar blast case was executed by NIA convicts. But in the case of Mecca Blast, the thrill continues. Between 1999 and 2006, many members of the organization held meetings. In 2004, Ujjain took a key decision in the Kumbh Mela, 2005 and 2006 conventions. The NIA had said that "Bomb ka jawab bomb se dena hi'na" has been sharpened for the bomb blasts. White. In 2005, he was staying with a fake address in Gujarati Dharmasala in Jaipur. Muslims have planned to explode bombs in areas where they live in high places. On January 4, 2006, Ramchandra and Sunil Joshi trained in the bombing and bombing of the Bagli area in Madhya Pradesh. He was trained in firing on Haryana on the 16th. In 2006, a four suspect Ramchandra Kalsangra Bhopal brought explosives. The Mecca Masjid was carried out by Tejram Parmar and Rajendar Chowdhury to carry out the explosion. May 17, 2007, joined the Bhopal Railway Station from Indore in Maruti. There was a man named Ramji who brought the ingredients to Ramji. Under the stone 400 years of explosives were placed. Two mobile bombs were detonated in the afternoon at 1.18 minutes. The NIA in Chargeset filed the case with the witnesses, including the evidence, that the bomb was identified and weakened by another bomb. Bharat Mohanlal and Rajender Chaudhary are currently in the Amba la jail in Haryana, in the Samjhauta Press blast case. Tejram Parmar alias Khalifa was released on bail. Sunil Joshi died in suspicion while in jail. Amita Chowdhary, Amit Chauhan, Devender Durga, Swami Asimananda, Bharathabai and Lokesh Sharma are absconding. Asimananda Swamiramachandar and Amit Chauhan, together with Malegaon bomb blasts, blasted the blast at Mecca Masjid, according to the National Investigation Agency's Court of Appeals. Nandapalli court granted Bharat Mohanlal Riteshwar alias Bharat Bhai, Swami Asimananda, a year ago. 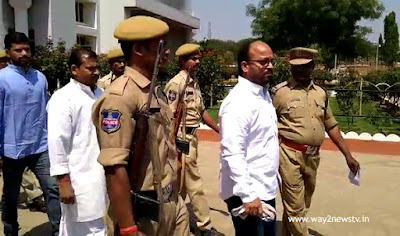 Ramchandra Kasagra, the most wanted accused in the same case, is suspected to have died of Sandeep Dange. There is a scandal that police detained 70 Muslim youth after the blasts of the Mecca Masjid were tortured. In 2011, the government paid damages to the youth. On the recommendations of the National Minority Commission, the government paid compensation of Rs 20,000 for 50 Muslim youths and Rs 3 lakh for 20 people.